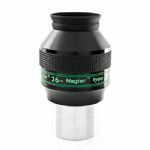 Televue 26mm Nagler Type 5 Eyepiece - 2"
The Televue 26mm Nagler Type 5 eyepiece is a 6-element design that opens the door to the largest possible true field in the Nagler eyepiece line. 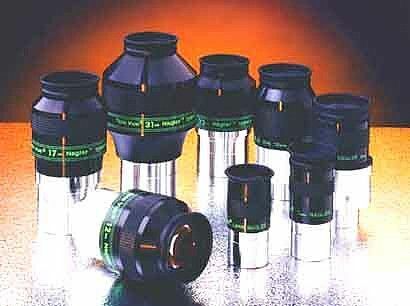 This is a 2" barrel design with an 82º apparent field of view and 16mm of eye relief. The Televue 26mm Nagler Type 5 has blackened lens edges, anti-reflection threads and rubber eyeguards deliver maximum contrast. There is no better ep in this focal length on the market today.It has good eye relief is razor sharp to the field stop has good contrast and has a much flatter field than a Panoptic.It gives an exit pupil of 5.2 mm in my 20 F/5 dob.It,s as good as the 31mm T/5 if not better.This is a life long keeper and worth every penny of it,s asking price.